Jordan Peele's Us gets an unsettling animated fan-made poster. The director has one of the most anticipated movies of 2019, and even with the trailer, we still have no clue what we're all in for when the movie hits theaters in March. 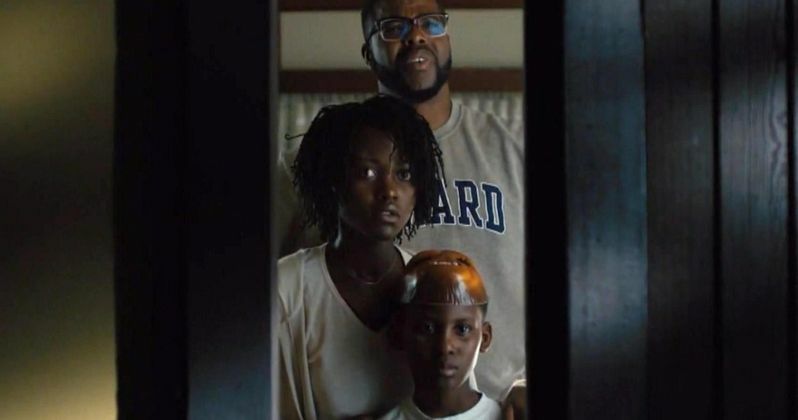 From what we can see, the Wilson family, which includes Adelaide (Lupita Nyong'o) and Gabe (Winston Duke) along with their children, comes under attack from some mysterious shadowy figures. The figures are The Tethered and they are the doppelgangers of the Wilson family. In the animated fan-made poster for Us, one of The Tethered is featured with the golden scissors in her hand. At first glance, the poster doesn't appear to be animated, but out of nowhere, the scissors come forward. It's really simple, but it leaves a really unsettling feeling after watching it a few times. When Jordan Peele was asked about the scissors and rabbit imagery in the promotional material, he noted that he thought they were scary elements while being inane at the same time. The director enjoyed subverting those two specific images while making the horror movie. The Tethered are included in Us as a way to remind us that we can be our own worst enemy at times. Jordan Peele says that he wanted to create his own mythology for the horror genre that "explored our duality and the duality of the characters." The results look pretty creepy, and in true Peele fashion, we are still left in the dark as to what will go on in the movie in terms of the specifics. The story will more than likely have some pretty crazy twists and turns. Jordan Peele undoubtedly has to feel some pressure after making Get Out. The movie won him his first Academy Award and was widely praised by critics and moviegoers upon its release. With all of the accolades, Us is going to be put under the microscope, but Peele looks to have created something new and separated from Get Out, which means people probably won't be able to easily compare the two. There already appears to be a lot of destruction in the movie, which already separates itself from Peele's last big screen project, though the end of that movie got pretty crazy. Us hits theaters on March 22nd, which is just around the corner. Lucky attendees at SXSW this year will get a chance to see the movie a few weeks earlier on March 8th. Hopefully, no spoilers will find their way on to the internet, allowing everybody to go into theaters without any information other than a few reviews. With that being said, excitement is very high for the horror movie, which is proven with the fan-made poster and all of the speculation threads on social media about it. You can check out the fan-made animated Us poster below, thanks to Reddit.